Astronomers don't know exactly how high-energy X-rays are produced near a black hole. Here's what the think: Material from a large torus of gas and dust is pulled toward a black hole. Most of the infalling gas is concentrated in a rapidly rotating disk, and a hot atmosphere or corona where temperatures can climb to billions of degrees. Collisions of low-energy optical, ultraviolet and X-ray photons from the disk with the hot electrons in the corona boost the energy of the photons up to the high-energy X-ray range. Incredibly massive black holes had fully matured just a billion years after the birth of the universe, according to two separate studies. Scientists already had strong evidence that black holes grew to gargantuan heft early in the universe. Several have been found to pack the mass of hundreds of millions of Suns or more. But now scientists are pushing the limit of how far back in time they spot such objects and improving the firmness of their measurements. In a study announced today, a black hole catalogued as SDSSp J1306 appears to be about one billion times as massive as the Sun. It is 12.7 billion light-years away, meaning the light just recorded -- by NASA's Chandra X-ray Observatory -- took 12.7 billion years to reach the vicinity of Earth. The universe is thought to be 13.7 billion years old. A similarly massive and distant black hole was studied recently with the European Space Agency's XMM-Newton X-ray satellite. The object, SDSSp J1030, is 12.8 billion light-years away. "These two results seem to indicate that the way supermassive black holes produce X-rays has remained essentially the same from a very early date in the universe," said Daniel Schwartz of the Harvard-Smithsonian Center for Astrophysics. Schwartz was involved in the Chandra study. "This implies that the central black hole engine in a massive galaxy was formed very soon after the Big Bang." The Big Bang is the leading theory for the origination of the universe as we know it. Black holes can't be seen, because light and everything else that gets too close to them falls in and becomes trapped. But as gas approaches a black hole, it is superheated, making it glow in X-rays. 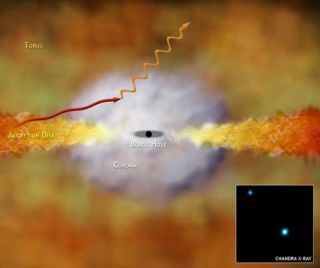 To find and measure black holes, astronomers examine these X-rays, along with the gravitational influence of a presumed black hole on the galaxy in which it resides. The results of both studies were reported in recent issues of the Astrophysical Journal. The black hole in the Chandra study is producing energy at the rate of twenty trillion Suns. How such massive and energetic structures formed so quickly remains a major puzzle for scientists. Mergers of smaller galaxies and their black holes may have played a role. Researchers suspect that black hole formation and galaxy development go largely hand-in-hand, but they cannot say which comes first.